I'm making an app with a skeumorph knob that you can turn clock- and counterclockwise to increase/decrease an amount. But what direction is the correct one? I bet that there is a high degree of cultural difference between countries/regions, and a high degree of difference depending on use-context. I live in Denmark, and "all" common radiators have a knob for turning up the heat - you have to turn it counterclockwise to increase the heat. This might just be a radiator-thing or just a Denmark thing. Let's say the app I'm making is controlling a radiator via wifi, should I follow the local norm, or just decide on a "correct" global way...? I'm not sure there's a cultural difference, so much as a mechanical difference. Radiator thermostats are valve mechanisms, which are tightened by screwing clockwise and loosened by screwing counterclockwise. That is to say, you loosen the valve by turning it counterclockwise to allow more hot water into the radiator. 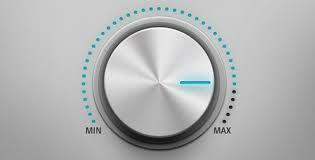 Knobs and dials on electrical devices (for changing audio volume, time, speed etc.) almost universally work in the opposite direction, turning clockwise to increase a value and counterclockwise to decrease a value. This increase/decrease is typically represented visually on a linear scale, from left to right, lowest value to highest value. Electrical thermostat controls, including both the old style and the modern digital and app based thermostats, tend to follow the electrical (counterclockwise/left to decrease heat, clockwise/right to increase heat). I think the direct answers to your question are covered by the others, but it might be beneficial to provide a visual hint to the user. For example in a car heater you have a visual indication of changes as the knob moves. An alternate solution might be to use a vertical slider/buttons where up might more clearly mean increasing the temperature. A good thing to take advantage of here is the number line. The number line almost universally increases from left to right. You could use that analogy to unambiguously show your user which way to increase or decrease the amount of the “thing” your application deals with. The problem with a rotating knob (from now on the tap model) is that you could bend the number line with its center up or down leading to the ambiguity that your question is trying to solve. Another problem with the tap model is that it is very hard to use with a mouse. 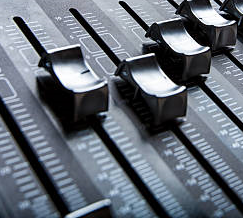 An option that is both intuitive and easy to use with a mouse is the linear increase-decrease button (from now on the sound mixer model). 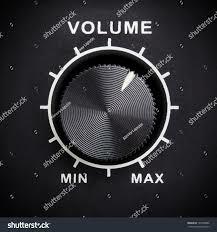 Think of the windows sound volume controller. Having a horizontal line knob gives you the chance to take direct advantage of the number line. 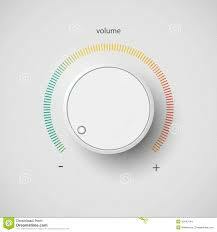 USe a vertical line knob, and you can take advantage of the fact that “up” can be associated with “more” and “down” with “less”. Nonetheless, you can always have a side bar showing (+) or (-); 0,1,2,…, 10; -5,-4,…,0,…,4,5; to objectively show your user which way to increase/decrease whatever you want to control (a rectangular triangle becoming thicker in the plus direction also works). For a skeumorphic knob really it depends on what kind of “thing” is going to be controlled. Most “material” fluids work using the tap model. For electrical or similar things however both options have been used in the real world, therefore you can have a linear skeumorphic knob in this case. Still an option to set things can always be put into the user's hands. The solution I’m giving should in principle be used as a default only. PS: You may want to search for the number line in the countries that use right-to-left writing (like Arabic) or up-to-down writing (like Chinese) to see if there is a different way to interpret it. However, these things can be fixed up using the operating systems globalization classes and automatically set the default for the increasing/decreasing direction. (*): In Visual Studio it is called a Track bar; in many other things it is a slider (from comment by wizzwizz4). EDIT: For mechanical or in this case, thermal machinery, you can use a lever as your skeumorphic knob and take advantage of the second option. The biggest advantages to this approach are that it's a more natural motion to make with a mouse or finger, and also that it's very common - every software synthesizer I've ever used uses this pattern, and it will likely be intuitive for your users regardless of what sort of knobs they're used to in real life. 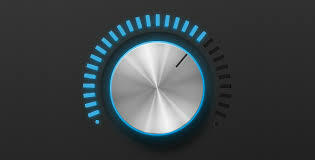 To be safe, you might consider, as part of the app's trailer or initial tutorial, including a video demonstration of the knob controls (like the above gif), so users know up-front that they should be sliding linearly, rather than trying to actually rotate the knobs. Some conventions are influenced by local custom, and others may be particular to a field or framework. 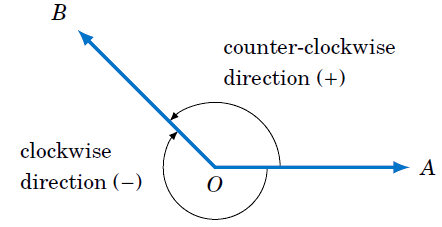 In the field of mathematics, for example, positive direction is assigned to counterclockwise rotation, and negative direction is clockwise direction. If your app controlled the angle of a telescope, you would be wise to follow this convention. In three dimensions, the positive direction is indicated by the direction of the axis perpendicular to the plane of rotation. You will also commonly encounter this convention if your application works with sensors such as the gyroscopes found in smartphones. All values are in radians/second and measure the rate of rotation around the device's local X, Y and Z axis. The coordinate system is the same as is used for the acceleration sensor. Rotation is positive in the counter-clockwise direction. That is, an observer looking from some positive location on the x, y or z axis at a device positioned on the origin would report positive rotation if the device appeared to be rotating counter clockwise. Note that this is the standard mathematical definition of positive rotation and does not agree with the definition of roll given earlier. This advice is intended primarily for scientific / technical applications. In all cases, you should consider whether there is already a dominant convention for similar applications. For example, the dominant convention for thermostats is clockwise = hotter. For temperature control, I would likely follow this convention even in scientific applications. There are differences throughout the world - here in the UK we general perceive clockwise motion to be increasing whereas, as you have pointed out, in Denmark the opposite is true. If you are building something for an international audience (or something that may be released to an international audience at some point) then you should be OK if you make sure there are clear verbal and non-verbal clues to show what will happen when the dial is turned. This could easily be done using a scale and icons. EDIT After a note from @MattObee (see comments below) It may well be the case that the paradigm is still clockwise to increase but that the value being increased is not what you think it is. In this case it may be the tightness of the valve that is increasing rather than the temperature. Speaking strictly from the perspective of the user experience: think only about how people use radios (or, if you're older like me, their TVs). Clockwise increases volume and advances the station to higher numbers or frequencies. Counterclockwise decreases volume or retreats the station to lower numbers or frequencies. That's what people are most conditioned to expect. Fluid and gas valves are, I suspect, contextually different. I've never known anyone to ask, "why does a water valve decrease flow when turned clockwise and a radio knob increase volume when turned clockwise?" In an electronic or digital world, we never think of mechanisms like valves. You can probably thank old-school TV and radio for that. In the good old days, radio used a string to move a pointer along the frequency chart. Since English-speakers (and a great many others) read left-to-right, the pointer was designed to move right to find higher numbers. Turning a knob to the left to move a pointer to the right doesn't make sense... thus, clockwise for greater was probably born! If you are making an App for a radiator, you should check that specific radiator and make sure you use the same direction. This shouldn't be a problem because the software needs to know in which direction to turn the physical knob it's controlling. But I think you just meant this as an example. In general: Make sure to unambiguously tell the user. I feel the other answers don't emphasize this enough if they explicitly mention it all: Don't assume the user to know! The sheer amount of answers this question has so far makes it clear the direction is not obvious, and if something is not absolutely obvious to everyone, good UI helps the user. At the end of the day, doesn't the answer lie in the word 'clockwise'? Time is experienced one way only -it advances, and values increase accordingly. This, to my way of thinking, is the most natural way of looking at it. Not the answer you're looking for? Browse other questions tagged usability hci or ask your own question. Is HCI applicable to game design in the way I'm trying to apply it? Will a Paste button increase usability? Increase zooming scale at higher scales? Which way should the indicator arrow be facing for this interaction? Which is the best way to display “Favorites” in a mobile app? How can I increase user adoption on a single-page app? Is it usable to start application with asking the user to turn Location services? which form design is better?